There are few things more satisfying on a boring weekend than ordering Chinese takeout. 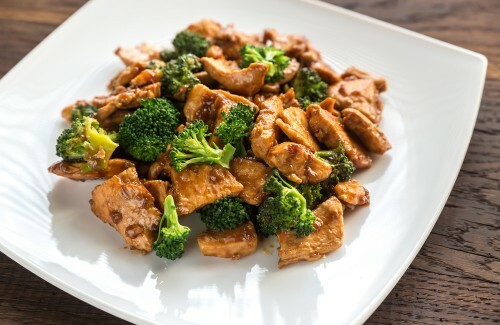 Best of all, there are plenty of vegetarian options with Chinese food, and the dishes tend to be loaded in vegetables. Not only can you enjoy something that tastes delicious, but it can also be good for your physical health. You just have to be careful not to overindulge because a love of Chinese food could quickly add to your waistline! There is one caveat with this list though. All of these dishes tend to be Americanized versions of Chinese food. China is a gigantic country with over a billion people. With so many different people and cultures, there is a wide variety of different cuisines. It would be impossible to represent them all on this list, and many of our favorite authentic Chinese dishes can really only be enjoyed in China. Instead of focusing on such a variety of Chinese cuisine abroad, we listed the 20 best Chinese food dishes that you can find close to home. You should be able to find most of these dishes at Chinese food restaurants in the United States, Europe and other western nations. This is a traditional favorite in the west. Many Chinese restaurants actually include soup with the entree that you ordered, so you can easily try this dish with your lunch or dinner. This dish is made up of wispy beaten eggs, pepper, scallions and tofu cooked up in a boiled chicken broth. Some restaurants add veggies to the mix or subtract the tofu. Whatever they do, it still tastes delicious! 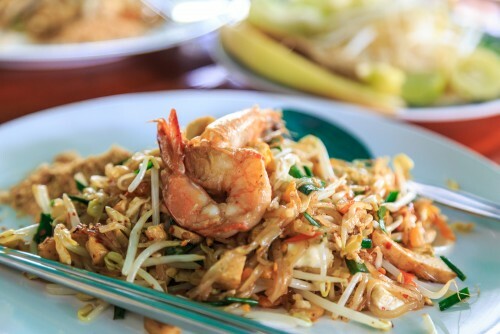 While most American dishes avoid bean sprouts, we really think that they deserve a second look. Our favorite sprouts ever are mung bean sprouts, but just about any sprout will tickle your taste buds. Plus, this recipe includes a healthy blend of shrimp. The iodine in shrimp is supposed to be great for people with thyroid disorders. 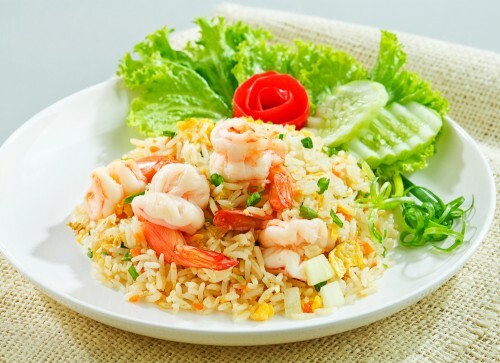 Just about every Chinese restaurant will offer different types of fried rice. This option may just include a bunch of vegetables, or it may include tofu as well. If you get the option, choose the fried tofu—it is by far the best tofu option they offer (in our opinion). 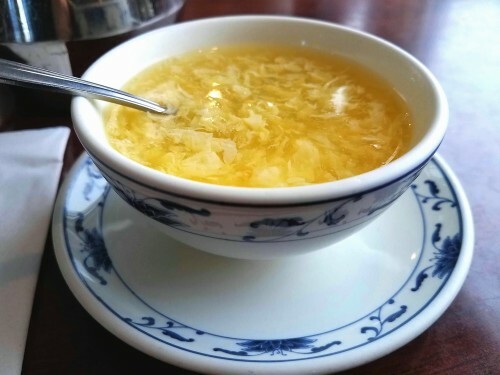 If your Chinese restaurant does not offer egg drop soup, then they will probably offer wonton soup instead. 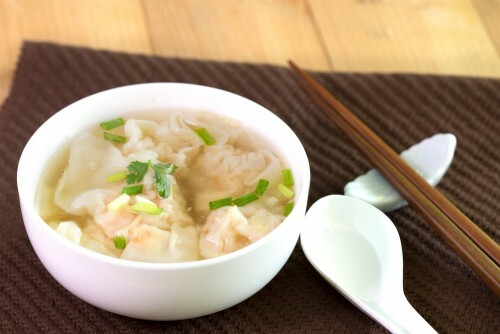 This soup generally includes dumplings, and it is a specialty at many restaurants. 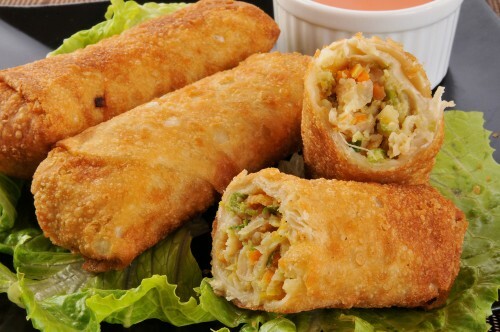 Egg rolls are similar to spring rolls and are often used as an appetizer at Chinese restaurants. They may include just vegetables, or they may include meats like pork. Spring rolls originated in China and were typically consumed during springtime, which is probably how they got the name. 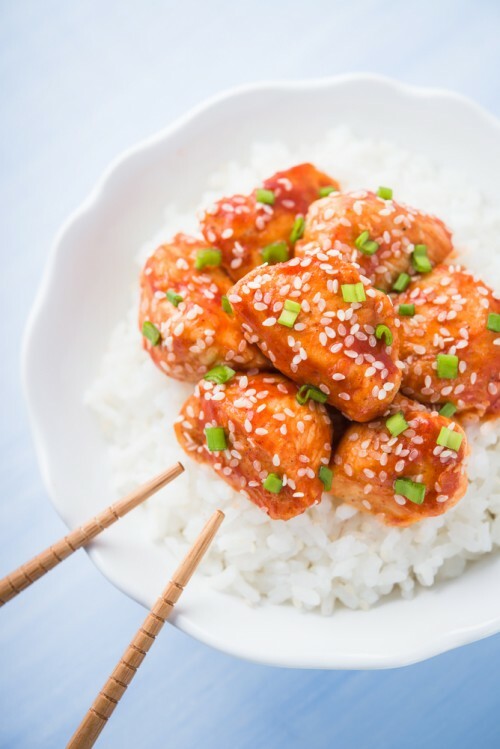 This dish includes crispy, delicious chicken cooked with sesame and honey before being tossed on top of steamed white rice. 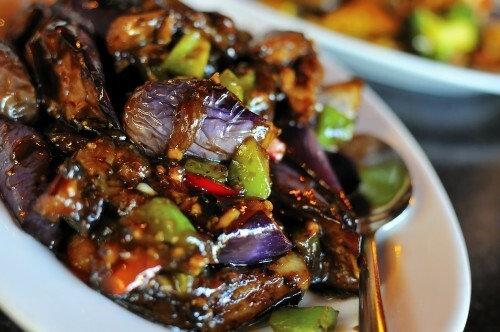 If you have never seen Chinese eggplants, you should check them out. They are longer and thinner than western eggplants. Whenever we go to the Chinese grocery store, we always stock up on plenty of these to cook up with chilies and garlic. This delicious recipe is easy to customize. 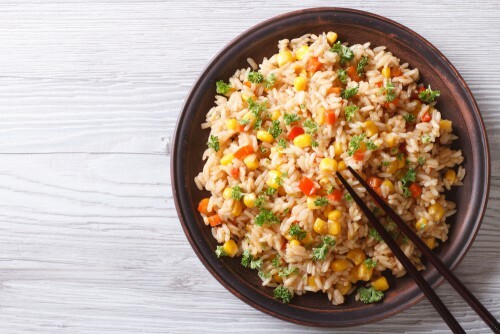 Like other fried rice options, it starts by simply frying up rice with things like cabbage, carrots or peas. Then, you can customize the dish with foods like shrimp as well. Unlike some restaurant foods, this one still tastes great after being in a fridge all night! Dumplings are by far one of our favorite dishes. When we lived abroad, there was a dumpling place with different varieties and fillings. 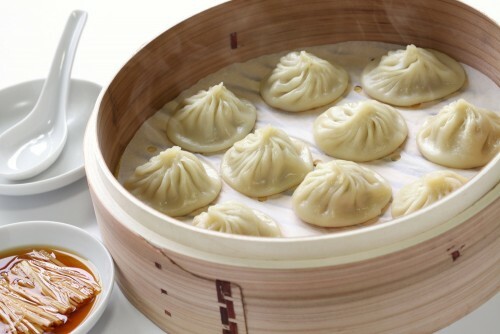 For about $2 to $3, you could stock up on a variety of dumpling options for your lunch. 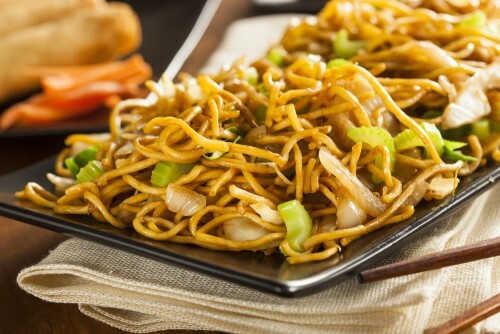 Chow mein is actually an anglicized way of writing the Chinese words for “fried noodles.” The name is appropriate because that is essentially all that this dish is. You can get this dish with just about any topping, but we really enjoy the vegetable version. 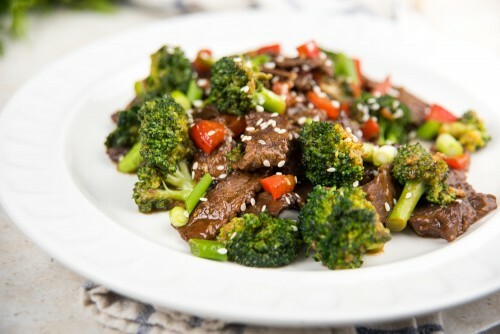 If you want to switch up your normal routing of beef and broccoli, this is a delicious, nutritious alternative. 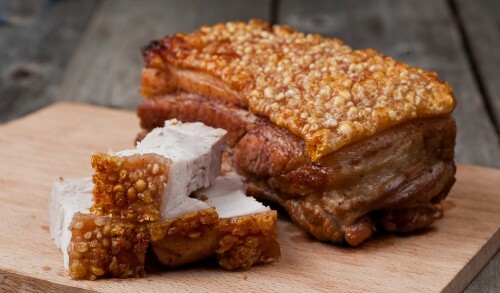 This is one of the most popular Chinese dishes in the country. It consists of beef and broccoli as the name suggests. Like many Chinese dishes, it can easily be cooked up in a wok. The meat is pre-cut, so you only need chopsticks or a fork to eat it. Interestingly, basically every type of traditional Chinese dish includes cut up meat. When I asked about this tradition, I was told that it was because it was considered impolite to have a knife at the table. The name does not do this dish justice. While I do not recommend attempting this at home, this dish is amazing to gorge on at a restaurant. 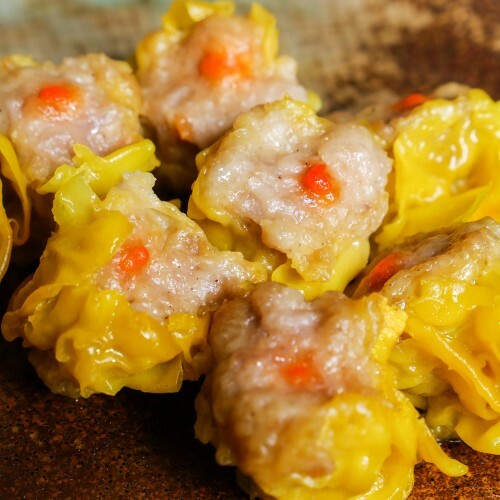 This is one of our favorite dim sum options. It is made by putting the shumai in cabbage-lined steamers. The steamers cook the dumplings thoroughly without drying them out. It is also to modify the recipe to make gyoza, but we really think that this version is one of the best. 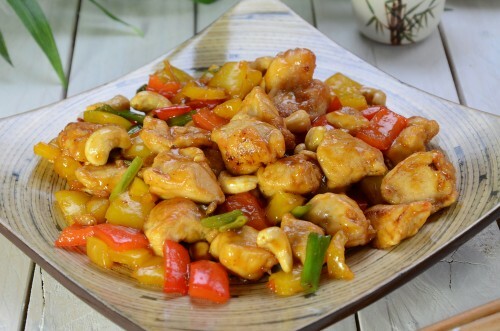 This dish includes honey, garlic and chicken. What more could you ask for? Remember though—this tends to be made a little spicy. If you have a low spice tolerance, you should always talk with your server first to make sure that you do not get any unwelcome surprises. When it comes to your dinner, your most basic option is fried noodles or fried rice. 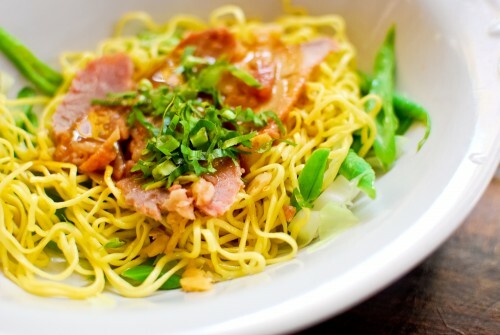 You can’t go wrong with Chinese pork with noodles. This delicious recipe is so good that you could eat it for essentially every meal without getting tired of it. It is also another one of the options that still tastes great as leftovers. If you love spiciness, then this is the dish for you. You can ask to have it made even spicier, but it will already leave your mouth watering with spice. This dish is certainly one of the more popular options at Chinese restaurants. Bear with us on this one. We know that the West tends to avoid using oyster sauce on anything, but this dish will make you change your mind. 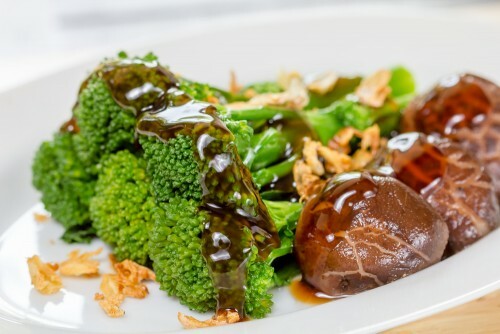 Toss a few vegetables in with the broccoli, add some oyster sauce, blend in a few unique flavors, and you have a dish that you will gobble down in seconds. 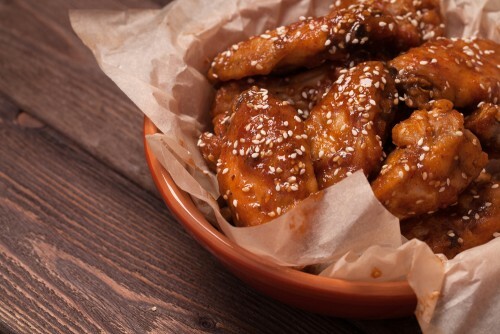 If you like sweeter options, go with the honey chicken we mentioned before. 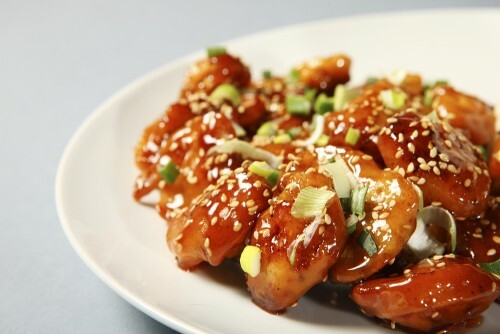 For something a little less sweet, the sesame chicken is sure to please. 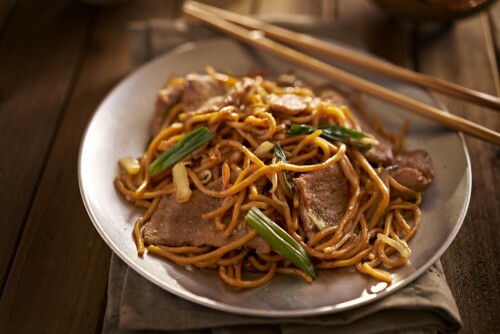 You can order just lo mein, but we think that adding beef to it gives the dish an added flavor. Plus, it gives you the protein that you need to really feel full. You probably won’t have too much of a problem feeling full though because this dish is good enough to eat down to the last bite.